A century ago today, a jittery Frederick Seddon hanged at Pentonville Prison for murder. Seddon, the district superintendent of the London and Manchester Insurance Company, wouldn’t have been the type to appreciate the irony. He was a prosperous little man who knew the value of a pound and not enough else. Now, Jane Austen would have us believe that “people always live for ever when there is an annuity to be paid them,” but this was not at all the case with Miss Barrow: just a few months after emptying her coffers into Seddon’s, she took ill with stomach pain, refused to pony up for a hospital visit and made Mrs. Seddon nurse her,** and after two weeks’ misery finally died in her bed on September 14, 1911. The doctor who had called on her a couple of times ruled her, sight-unseen, a casualty of a going diarrhea epidemic, and handed to Seddon a death certificate which conveniently enabled him to arrange her immediate funeral, on the cheap. Only when Barrow’s relatives caught wind of her fate and came calling, there to get short shrift from the landlord along with news that all their prospective inheritance was now his, did the strange dead woman get on her way to becoming a household name. When the corpse was exhumed fully two months after burial, there was still enough arsenic in it to kill a person. Odorless, colorless, and tasteless, with symptoms mimicking gastrointestinal disease in a time when cholera was frequent and autopsies were rare, arsenic got its reputation as “inheritance powder” from its supposed-but-difficult-to-prove widespread use in the 19th century to hasten inconvenient rivals and relations off this mortal coil. The stuff was also pretty easily available, in products like flypaper. The Seddons had purchased some arsenical flypaper a few days before their lodger fell ill, and the inference is that they soaked it† (which you’re supposed to do) and then laced the resulting poison-laced water into Barrow’s victuals (which you’re not). 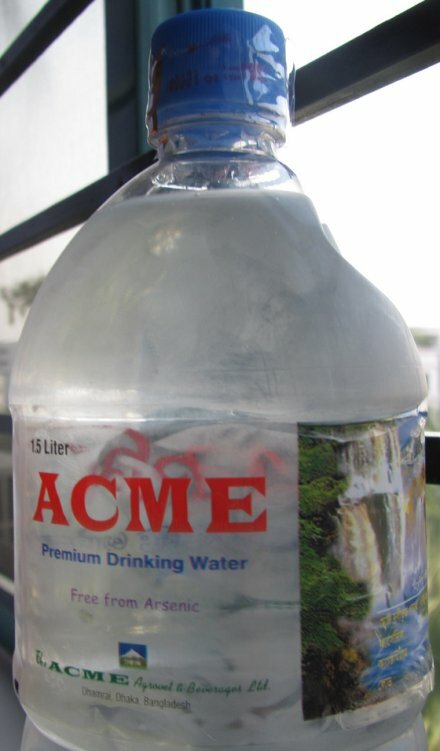 It’s her own fault she didn’t insist on Acme brand arsenic-free water. (cc) image from Carlton Browne. All this admittedly incriminating stuff hung together as a case on so much supposition: that Barrow died from arsenic, and that the otherwise un-homicidal Seddons had means, motive, and opportunity to kill her, did not quite add up to proof positive. Of course, one of the many murderous virtues of arsenic was the ease with which one could administer it, suspicion-free. Very rarely did anyone glimpse the villain, eyebrows peaked and mustache a-twirl, theatrically tapping out drops from a skull-labeled vial: even with the forensic methods coming online, arsenic allegations were circumstantial as to who and how and why practically by definition. Progress of the case that winter made headlines all over, the biggest thing to hit the bar since Dr. Crippen. It also became a permanent entry in the lawyers’ primer on why not to let your client testify. Both Frederick Seddon and his wife Margaret stood trial together, and the evidence against each was pretty much the same. But Margaret was a slam-dunk acquittal, and in fact the judge’s charge to the jury all but directed that result. 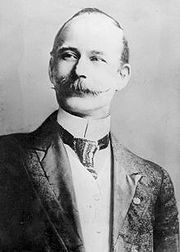 Seddon insisted on his innocence to the very last, and to read with that idea in mind the testimony he gave for himself, it rarely looks substantively damning. But Seddon’s carriage reputedly pulled together for the jury all the trial’s circumstantial bits, into a believable story of a mean and stone-hearted fellow fully capable of killing for lucre. His demeanor was calm to the point of coldness, his command of the finances in his life meanly obsessive, and he showed unnerving insensibility to human fellow-feeling with his late tenant (he started selling her jewelry the day after she died) or her bereaved (he made only a perfunctory effort to notify her family, and gave them little help when they did show up on the grounds that none was the legal next of kin). “I am not so ready to think evil of people,” Frederick Seddon said ingenuously at one point when the topic was other people who might have been robbing Miss Barrows. It’s like it didn’t occur to him even while on trial for his life that anyone might think evil of him. Take, for example, this response to the suggestion that he had stolen a couple hundred pounds sterling from the trunk in Eliza Barrow’s room immediately upon her death. Your suggestion infers [sic! sort of!] that I am a greedy, inhuman monster, committing a vile crime, such as the prosecution suggests, and then bringing the dead woman’s money down and counting it in the presence of my assistants. The suggestion is scandalous. I would have had all day to count the money. It has a sort of autistic genius, an absolute tone-deafness that would be impossible to place in a literary character’s mouth lest the scene collapse into slapstick. Jurors must have taken the bloodless insurance adjustor for an insect, and accordingly had not the least compunction about squashing him. Here’s more Seddon testimony under cross-examination. Again, it’s not exactly self-incriminating, but sufficiently calculating and blase to give you the willies when juxtaposed with late events of his life. The ATTORNEY-GENERAL proceeded to question Seddon on the subject of the annuity which he said he granted to Miss Barrow in consideration of the transfer to him of her leasehold property and India stock. Had you ever done an annuity transaction before? This has turned out a remarkably lucky investment from a money point of view? According to what has happened, you paid out altogether £91 and the whole of the property fell to you — you had no longer any money to pay out? You had got the property on the condition that you were to pay out an annuity? What I am putting to you is that when she died you no longer had to pay out money to her? You were dealing with this woman, who was living in your house and who had no other advice, certainly as regards this matter? In reply to further questions, the prisoner said he only benefited to the extent of 28s. per week by not having to pay the annuity. Asked whether there would be any one else who would benefit by Miss Barrow’s death, he said he had never given that question any consideration. Asked whether he thought Miss Barrow was a person of ordinary mental capacity, he replied “Yes,” adding that he considered she was a very deep woman. As an insurance agent he from his observations considered that she was an indifferent life. Did you form that opinion when you were negotiating with her for the annuity? Your view was that she would not live over that term, and according to your view she would live less? The jury only needed an hour to shorten Frederick Seddon’s life expectancy to the next few weeks. Frederick Seddon receives his death sentence on March 15, 1912. Yet even with the black cap on his head, the judge — a Freemason to whom fellow-initiate Seddon nakedly appealed in open court, “before the Great Architect of the Universe,” for remission of the penalty — couldn’t really articulate exactly what Seddon had been convicted for. [E]ven if what you say is strictly correct, that there is no evidence that you were ever left at the material time alone in the room of the deceased person, there is still, in my opinion, ample evidence to show that you had the opportunity of putting poison into her food or into her medicine. You had a motive for this crime. That motive was the greed of gold. Whether it was that you wanted to put an end to the annuities or not, I know not — you only can know. Whether it was to get gold that was or was not, or that you thought was, in the cash-box, I do not know. But I think I do know this — that you wanted to make a great pecuniary profit by felonious means. That’s been the verdict on Frederick Seddon ever since. * As much as this reads like a transparent con, the modern reader probably won’t have to stretch very far to suppose why Eliza Barrow might have set more stock by a trusted neighbor with a bookkeeper’s heart than she would by dubious machinations of distant and unaccountable economic institutions. Heck, there’d only just been a bank run. ** Reported regimen: barley water and milk, beef juice, and soda water. Mmm-mmm. † Trial testimony recounted at least one case where the landlords laid four pieces of flypaper into the soaking water. Since one was all that was needed, the presumptive purpose would be to strengthen the liquid’s concentration of poison. I think the jury convicted Seddon for being a cold, calculating, devious *********. Maggie Seddon was very lucky not to hang too. She and her husband had both been young when the Maybrick case was prominent in In Liverpool, when poor Florence Maybrick was supposed to have poisoned her husband with arsenic from fly papers.